Ok, cool. We’re done here. Thanks for reading! This is a fairly stock version of Jund. It doesn’t have any pet cards or cute tricks. It does have several singletons, but they round out the package in an attempt to mitigate each other’s restrictions. Something like Phyrexian Arena might seem more appropriate, but Dark Confidant does so much more. The lower mana cost gets it into play faster, the body puts pressure on the opponent if they don’t have blockers, and offers the ability to block in a pinch. Versatility is critical in a deck like Jund. Opponents can do all sorts of things in Modern, and you want your cards to be good in as many different scenarios as possible. Phyrexian Arena does a better job of drawing cards, but it can’t do anything else. Identify how low you are willing to let it drain your health. Against U/W Control, I’m happy to go down to 4-3 life before I start getting worried. Against Burn, I’m probably taking the first decent trade I can find. If you can’t afford the life loss from another flip, you have to kill Dark Confidant on your opponent’s turn. It triggers as soon as your turn starts, so the trigger happens even if you kill it on your upkeep. If your opponent doesn’t provide an opportunity to remove it, don’t hesitate to aim a removal spell at it. Scavenging Ooze provides some instant speed life gain. Don’t forget to take that into account if you want another Dark Confidant trigger. 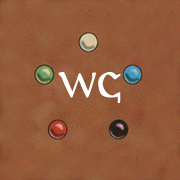 Four is the current maximum CMC in the deck. If you have a game locked up, make sure you stay above this threshold. If your sideboard contains higher CMC cards (probably unwise), the number goes up (duh). Keep a die on top of your deck so you don’t forget the trigger. Even if you are confident that you’ll remember it, just do it. It’s a stupid reason to pick up warnings, and it’s completely preventable. Also, don’t forget to return the die after you shuffle your deck. 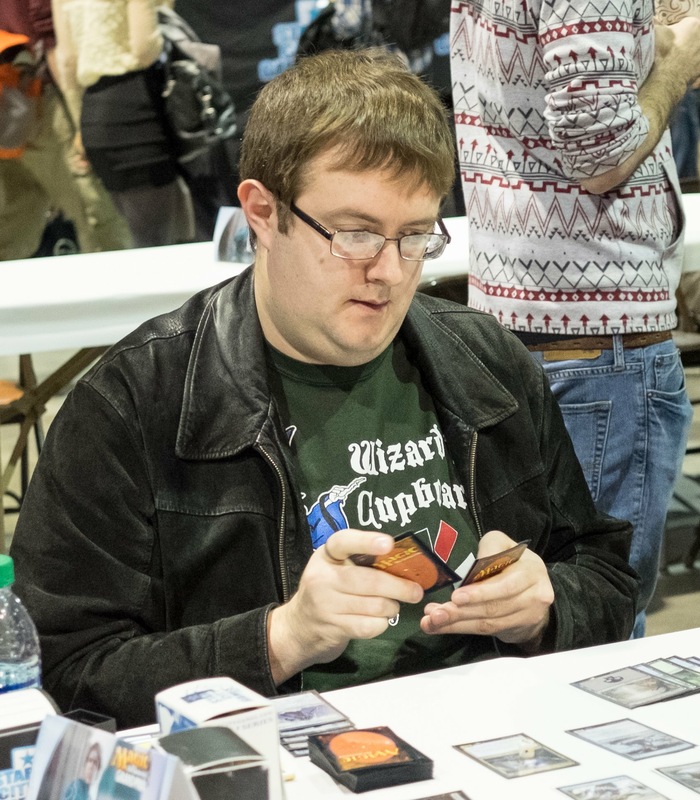 There are a lot of nuanced reasons why Dark Confidant is a great card in Jund. Tarmogoyf just attacks and blocks really well. 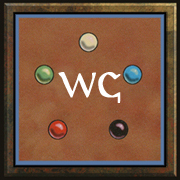 Tarmogoyf is traditionally a 4/5 by the time you care about stats, since instant, sorcery, creature, and land all wind up in the graveyard consistently. You usually need a little help from the opponent’s deck to get Tarmogoyf into the truly absurd range, but that’s alright. A 4/5 is large enough to rumble with just about anything in Modern. The printing of Fatal Push dropped the stock of Tarmogoyf a little bit, but Jund’s resurgence has brought Lightning Bolt back into prominence (which I’ll discuss later). 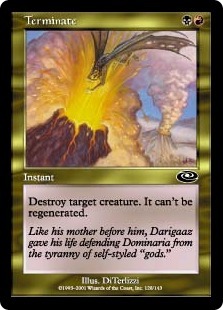 Make sure you are familiar with how Tarmogoyf interacts with damage based removal. If Tarmogoyf takes exactly lethal damage from a spell that adds a new card type to the graveyard, Tarmogoyf will not die. State based actions won’t check a creature’s health until a spell finishes resolving, so the spell will be there to boost Tarmogoyf’s toughness when the game can check for dead creatures. Scavenging Ooze has several roles in Jund. Like Taromogoyf, Scavenging Ooze can serve as a good roadblock. It isn’t as good on turn two, but Scavenging Ooze’s lifegain mitigates the damage lost from playing a two mana 2/2. In the late game, Scavenging Ooze simply dominates. It immediately grows to preposterous sizes, gains a ton of life, and obliterates any graveyard synergies the opponent has. Dredge, Snapcaster Mage, Kolaghan’s Command, and Tarmogoyf all an Ooze and green mana. Delve spells only last a couple turns before they are shut off too. Scavenging Ooze is the biggest draw to green mana in Jund. The only other cards in the deck that need two green mana are the creature lands (Raging Ravine and Treetop Village) that require green mana to activate. There are a lot of uses for black mana in the deck due to the hand disruption spells and Lilianas. A copy or two of Twilight Mire usually make an appearance to aid Scavenging Ooze activations. The lady that brought Jund back on the map, Bloodbraid Elf does a little bit of everything. A 3/2 haste body is naturally going to push the deck to be more aggressive. Beyond that, Cascade is a fantastic mechanic for card advantage and against blue control decks. 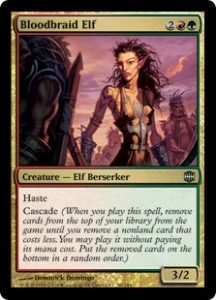 Bloodbraid Elf restricts some of the cards you want to play in your deck. Fatal Push is usually a better removal spell, but Lightning Bolt isn’t a Cascade miss when the opponent doesn’t have any creatures. Casting Bloodbraid Elf isn’t as simple as reaching four mana. You need to evaluate what your opponent is doing and how you can best react to it. Are they trying to Storm you out or assemble Tron lands? Fire off a BBE as fast as you can and try to close out the game. Are you playing the mirror? It’s pretty disastrous to waste a Cascaded removal spell, so you probably want to wait until they have a creature. Playing against U/W control? Bloodbraid is one of the best ways to recover from Supreme Verdict. I mentioned with Bloodbraid Elf, Lightning Bolt is popular in Jund since it can still do something if the opponent doesn’t have a creature to hit. Lightning Bolt is also stronger against combo decks, where three damage to the face can shave off a turn on your clock. Lightning Bolt competes with the newcomer Fatal Push for the cheap removal slot. Don’t be scared to board out Lightning Bolt in the right matchup. 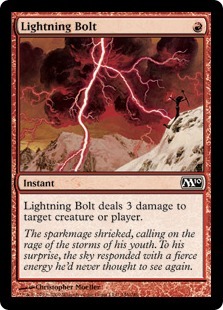 Players often leave Bolt in against control decks, planning to kill planeswalkers or Snapcaster Mages. That is a great way to get outvalued, and exactly what Jund wants to avoid. If you aren’t looking to board in removal in sideboarding, Lightning Bolt should probably be coming out. 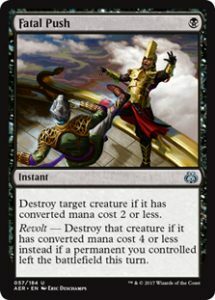 Lightning Bolt’s new competition since the pre-banning era of Jund, Fatal Push is excellent removal against anything small. Previously, black’s removal was limited to cards like Doom Blade, Go for the Throat, and Geth’s Verdict, all of which have some heavy restrictions. Fatal Push, even without Revolt, kills a wider selection of creatures than anything before it. With Revolt, Fatal Push kills all but about five popular creatures between all of the upper echelons of Modern decks. Adding Fatal Push to Jund requires a better understanding of the metagame you expect. If you run into a bunch of combo and control with a full complement of Lightning Bolts, you aren’t going to get severely punished. If you show up with a full set of Fatal Push, you’ve got close to four completely blank pieces of cardboard in your deck. If you are running into the mirror and Humans all day long, you’ll be happy that you added Fatal Push. Jund’s gameplan is to bring everybody down to zero resources and then win with whatever comes off the top. Inquisition of Kozilek is the perfect card for this kind of strategy. It will trade a full card for a full card without the opponent gaining some incremental advantage along the way. Inquisition of Kozilek does more on top of that. Casting a hand disruption spell in the early turns of the game can completely wreck an opponent’s curve. It can remove a creature in an aggressive deck’s curve. It can snag a removal spell so that Tarmogoyf can dominate the board. It can steal a counterspell so that Dark Confidant can resolve and take over a game. The split between Inquisition of Kozilek and Thoughtseize is difficult to perfect, and it changes constantly. Thoughtseize can take a lot of cards that Jund would struggle with, but the life loss is terrible against Zoo or Burn. If you expect aggressive decks, Inquisition of Kozilek is your card. Everything covered with Inquisition of Kozilek applies here too. Thoughtseize tags several important cards that Inquisition misses, including Cryptic Command, Collected Company, and various combo cards. If you are unsure, I tend to prefer leaning towards Inquisition of Kozilek over Thoughtseize. There are a lot of ways to gain edges against slower decks where Inquisition is worse. You only have so many plays available against aggressive decks, and the life loss from Thoughtseize further reduces your window to deploy cards. It’s difficult to reach a point where you should board out Inquisition of Kozilek. Affinity is probably the only deck that deploys its hand fast enough to consider it. If you are considering boarding out hand disruption, start with Thoughtseize, then move on to Inquisition if you still have cards to board in. You’ll notice I haven’t mentioned Tron yet. That matchup is horrendous, and there isn’t much you can do about it. Thoughtseize is miles better than Inquisition in that matchup, where your best bet is to strip their only action with Thoughtseize. After that, you have to try to race them before they find another haymaker. When you need to kill a creature, Terminate doesn’t ask any questions. It just solves your problems. When you need to kill something else, look somewhere else. 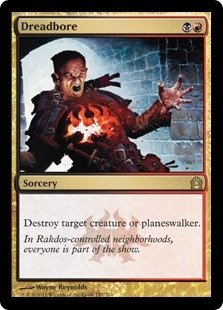 Trading in the instant speed on Terminate adds the ability to kill planeswalkers. Versatility is great, but Terminate kills a few things much better than Dreadbore. Creature lands are the biggest offenders here, since they are almost never activated at a point where Dreadbore can deal with them. Reality Smasher is another problem, but it is the only popular haste creature in Modern that outsizes Bolt and Push. If you feel like you have sufficient answers to those cards, Dreadbore killing Gideons, Jaces, Lilianas, and Karns is a huge boon. Jund can handle most of these, but it is nice to jump over any potential blockers and just be done with the problem. For creatures, Abrupt Decay is mostly a worse version of Fatal Push. It dodges Stubborn Denial out of Grixis Death’s Shadow, but that is one of the only times you need to be worried about getting a removal spell countered. 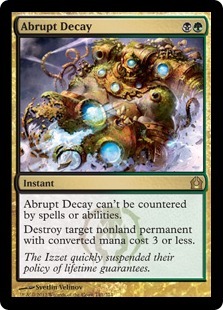 More frequently, Abrupt Decay serves as a maindeck answer to cheap, non-creature permanents. Cranial Plating, Detention Sphere, Spreading Seas, Blood Moon, and Ensnaring Bridge are all cards better off in the graveyard, and Abrupt Decay makes that happen. The description for Abrupt Decay mostly transfers to Maelstrom Pulse. Pulse does a few things better, like pad the number of removal spells that can kill big creatures. It also takes care of duplicates and tokens, which is unique for Jund’s removal suite. It is tough to fit in more than a copy or two, since Maelstrom Pulse is equal or more expensive than most of the things you want to kill in Modern. If you run too many expensive cards, you’ll fall behind to your opponent’s development. One of the other new kids on the block, Kolaghan’s Command offers a little bit of everything with some card advantage on top. The best value from Kolaghan’s Command is to rebuy one of the busted creatures in Jund, but every one of the modes has uses. 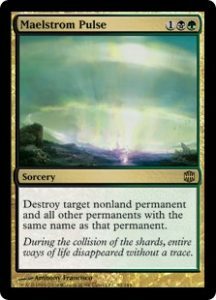 Having a maindeck source of artifact destruction outside of Pulse and Decay is helpful. Discard is always useful, and Kolaghan’s Command is an instant. You can target them with the discard effect during their draw step to make sure you get something. Also, between the damage and Shatter abilities, Kolaghan’s Command singlehandedly improves the Affinity matchup. The card is slow, so it’s worth considering when you need to make room for sideboard cards. Absolutely bananas. Liliana of the Veil is phenomenal against any decks that isn’t swarming you on the board. The mutual discard ability plays right into Jund’s strategy of bringing both players down to zero cards in hand. The minus ability protects Liliana by simply killing a creature, which is the upper limit for power on a three mana planeswalker. 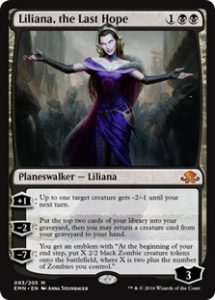 If you haven’t played with Liliana before, don’t be afraid to skip using her for a turn. If your hand is all good cards, or you need the lands in your hand to enact your gameplan, don’t just throw away cards for loyalty counters. Make sure to watch what your opponent is discarding. If you’ve got reason to think they are just holding excess lands to discard, it becomes less appealing to plus Liliana. This version of Liliana trades a phenomenal combo matchup for a good swarm matchup. Various combo decks couldn’t care about Liliana, the Last Hope, but it’s a nightmare for decks like Affinity and Elves. Liliana, the Last Hope is still good against grindy midrange and control decks, since the minus should be able to rebuy a good creature. If that doesn’t work, the ultimate should just win the game. I wouldn’t push for the ultimate very often, but it does sound sweet. That covers most of the traditional cards in Jund. I don’t think it’s possible to tweak the creature base much. Some people shave a Scavenging Ooze, but it has a ton of uses. The only reason to skip the fourth copy is how poorly they play in multiples. The hand disruption suite is fairly set too. Traditionally four to seven copies of Thoughtseize and Inquisition of Kozilek make it into the deck. I’ve tried Duress before, but it’s too easy to miss against a bunch of Modern decks. This is starting to sound redundant, but there isn’t much wiggle room for the planeswalkers either. Four copies of Liliana of the Veil are pretty much mandatory. Some people shave one, but that is an extremely bold metagame call. If you expect to play against Elves 50% of the time, maybe I could endorse it. One Liliana, the Last Hope is fairly standard, but it is definitely a flex spot. Chandra, Torch of Defiance used to show up in Jund occasionally, but it is difficult to fit in with a set of Bloodbraid Elves. That leaves the removal suite, which is highly customizable. I covered most of this already, but focus on cheap removal if you’re expecting aggressive decks. Move more towards the expensive, versatile removal if you are expecting slower, grindy decks. If you aren’t sure, you won’t go too wrong with a stock list. 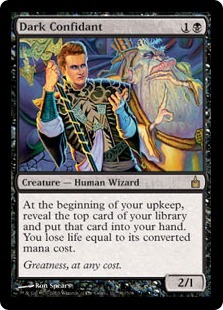 A lot of Jund’s customization comes from the sideboard. That’s a whole different animal, and it deserves an article on its own. I’m planning on covering that next. Until then, good luck!